Academic and industrial fluorine chemistry has experienced over the past decade or so a shift in emphasis from research on highly fluorinated materials to research on lightly fluorinated compounds. This in large part is because of the significant commercial impact of new fluorine-containing pharmaceuticals and agrochemicals coupled with the overall optimism about opportunities for sustained growth of fluorinated biologically active materials. More recently, a growing concern about the environmental fate of some highly fluorinated materials also has been a contributing factor. A consequence of this change in emphasis is that many of the centers of specialized excellence in traditional fluorine chemistry are much less prominent today, or they have disappeared altogether. Witness, for example, the dramatic change in industrial and academic fluorine chemistry in the UK over the past couple decades, and the same trend is evident in the US and Russia/CIS. It should come as no surprise, therefore, that synthetic fluorine chemistry is increasingly being practiced by chemists who would not consider themselves to be fluorine chemists. These chemists are mainly interested in useful, practical methods for introducing one or two fluorines, or a trifluoromethyl group, at specific sites in a molecule. Commercially available fluorinating agents or fluorinated starting materials and methods that do not require specialized laboratory equipment or handling procedures are of prime importance to these practitioners. This new volume for the Advances in Organic Synthesis series edited by Professor Kenneth Laali admirably fulfills most of these needs. An obvious strength of this volume is that its sixteen chapters were written by experts who either invented the various fluorinating agents and methods or helped scope the chemistry and applications. The coverage is intentionally not historical but rather contemporary where most of the literature citations are less than ten years old. This captures the modern developments and applications, but the non-expert may find the need to refer to earlier literature for a more comprehensive perspective. The volume is a tour de force on electrophilic fluorinating agents and their chemistry, leading off with selective fluorinations using elemental fluorine and mainly acetyl hypofluorite, which is easily and inexpensively generated from sodium acetate and fluorine. This methodology more than any other covered in this volume does require special care and equipment for handling elemental fluorine, but this should not be a deterrent since reliably safe procedures have been developed and published, for example, in Organic Syntheses. The next two chapters cover the use of interhalogen monofluorides, mainly BrF and IF generated in situ from the halogen and elemental fluorine, and their hypervalent halogen fluoride counterparts BrF3 and IF5, plus ArIF2, which is the most stable class of hypervalent halogen fluorides. The following chapter, the longest one with 97 pages and 262 references, is an Organic Reactions style survey of contemporary reactions of xenon difluoride. The diverse applications of XeF2 in synthesis are truly remarkable, although in most cases alternative less-expensive fluorinating agents do as well or better. An exception and an underutilized method is the “fluoro-Hunsdiecker” reaction where XeF2 cleanly converts primary or tertiary alkyl carboxylic acids to alkyl fluorides in good to excellent yields. Olah’s pyridinium and dimethyl ether polyhydrogen fluorides, Umemoto’s N-fluoropyridinium salts, and the N-fluoro-1,4-diazoniabicyclo[2.2.2]octane dication salts (SelectfluorTM, AccufluorTM), which are among today’s most popular and versatile reagents for selective electrophilic fluorinations, are thoroughly reviewed in the last three chapters on electrophilic agents. A particular highlight of this volume is the complementary Chapter 13 that reviews enantioselective electrophilic fluorinations employing various optically active N-F sulfonamides and sultams, and N-fluoroamine salts of cinchona alkaloids (generated by transfer fluorination of the alkaloids with SelectfluorTM). Enantioselective fluorinations with achiral N-F reagents catalyzed by chiral organometallic complexes also are described. This is state-of-the art methodology for direct chiral fluorinations, and although there remains room for improvement in the observed ee’s, its importance to the increasing demand for optically pure pharmaceuticals and agrochemicals cannot be overemphasized. Recent developments in nucleophilic fluorinations of primarily alcohols and carbonyl compounds and their derivatives mediated by the classical FAR (fluoroalkyl or –alkenyl-amino reagents) and DAST (diethylaminosulfur trifluoride) reagent and its modern analog Deoxofluor®, are nicely reviewed in Chapters 8 and 9. The former updates the use of the familiar Yarovenko-Raksha reagent, CFHClCF2N(C2H5)2, and Ishikawa’s reagent, CF3CFH CF2N(C2H5)2/CF3CF=CFN(C2H5)2, and introduces a new, relatively inexpensive reagent CF2HCF2N(CH3)2 that is easily made from tetrafluoroethylene and dimethylamine. Although it is not commercially available yet, it promises to be superior to the traditional FAR offerings. The following chapters on the synthesis of gem-difluoromethylene compounds, lightly fluorinated polycyclic aromatic hydrocarbons, and fluorinated carbohydrates illustrate many useful applications for several of the electrophilic and nucleophilic reagents from the preceding chapters. These reviews describe and sometimes critically compare the available options for introducing fluorine, but the reader likely will have to consult the primary literature cited to decide on the best choice to accomplish the desired transformation. The chapter on synthesis of chiral fluorinated materials via biotransformations is thematically rather out of place with the rest of the volume since it does not deal with fluorination reactions per se but rather covers enantioselective or diastereoselective reactions of fluorinated molecules promoted by biocatalysts, including lipase-catalyzed hydrolyses (kinetic resolutions) of fluorinated esters to chiral alcohols, enantioselective acetylations of trifluoromethyl-containing alcohols, and dead-cell promoted asymmetric reductions of trifluoromethylated ketones. Nonetheless, these green processes represent very useful methods for synthesizing chiral building blocks and products that should be part of the modern chemist’s arsenal of synthetic methods. It is unrealistic to expect that this single volume can cover all of the significant advances in synthetic fluorine chemistry. Although Rupert’s reagent, (CH3)3SiCF3, is briefly described in a couple of chapters, it along with other nucleophilic trifluoromethylating reagents warrant more extensive coverage. Absent are modern sources of truly anhydrous fluoride ion, as well as the new mild reagents and procedures to generate difluorcarbene for the synthesis of fluorinated cyclopropanes and difluoromethyl ethers, for example. One would hope that Professor Laali or an equally competent editor has plans for a second volume that will include these omissions and update other advances in synthetic organofluorine chemistry. In summary, this book is a valuable addition to the repertoire of modern synthetic organofluorine chemistry and an excellent source of information for synthetic chemists interested in selective fluorination methods and fluorinated building blocks. I was first introduced to fluorine chemistry over 30 years ago as a PhD student at Manchester University (with Robert Hazseldine). My involvement and interest in organofluorine chemistry grew during my postdoctoral years, in particular while in George Olah’s laboratory. Over the years, my research activities and interests branched out into other areas of mechanistic and synthetic chemistry, but I continued to maintain serious interest in fluorine chemistry and managed to keep some research activity going in the field whenever possible. Today’s synthetic organofluorine chemists have at their disposal a wide range of both electrophilic and nucleophilic fluorinating agents whose reactivities/ selectivites may be tuned to the task at hand. Further exciting new developments include the synthesis and utility of chiral electrophilic fluorinating agents, application of transition metal catalysis to enantioselective electrophilic fluorination, biotransformations for synthesis of chiral fluorinated materials, and the emergence of “tamed” fluorination under “green” conditions. Whether by improving on the more traditional reagents or by developing newer, more task-specific agents, the repertoire of synthetic organofluorine chemistry has greatly expanded during the last decade; and these advances are bound to create greater diversity in terms of structural, physical, and biological properties. 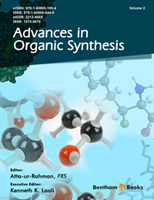 Early in 2004 I received an invitation from Dr. Atta-ur-Rahman, Editor for “Advances in Organic Synthesis”, to act as Executive Guest Editor for a volume within this series, on a topic of my own choice. I had contemplated for some time to edit and/or co-write a volume focusing on selected aspects of organofluorine chemistry, with an emphasis on recent advances. The invitation signaled an opportunity and created the impetus for me to begin the task of getting the project off the ground. I have been most fortunate that a large group of active scientists and leading researchers in the field expressed interest in this project and agreed to contribute. As editor, my goal has been to oversee the creation of a series of focused and self-contained chapters that summarize and put into perspective (preferably in a comparative fashion) the more recent advances in the field. The collection should serve as a valuable guiding source on the reactivity trends, efficacy, and scope which are illustrated via examples. It is gratifying to see that the final outcome far exceeded my initial expectations. Chapter 1. (by S. Rozen) describes the regio- and stereospecific electrophilic fluorination of tertiary centers and double bonds employing tamed F2, while also illustrating some new chemistry involving acetyl hypofluorite. Chapter 2. (by D. Shellhammer and V. Heasley) focuses on in situ generation and the scope of fluorination involving interhalogen monofluorides XF (X = Cl, Br, I). Chapter 3. (by S. Hara) deals with the characteristic features and representative reactions involving hypervalent halogen fluorides BrF3, IF5 and ArIF2. Chapter 4. (by B. Zajc) provides a comprehensive coverage of the organofluorine chemistry of XeF2 with emphasis on the more recent studies. Chapter 5. (by T. Umemoto) summarizes the synthetic routes to a variety of N-Fluoropyridinium salts with variable fluorinating power, illustrating their synthetic scope. Chapter 6. (by V.P. Reddy, G.K.S. Prakash and G.A. Olah) is devoted to onium polyhydrogen fluorides and their fluorination chemistry. Chapter 7. (by S. Stavber and M. Zupan) focuses on NF dication salts as efficient electrophilic fluorinating agents as well as functionalization mediators. Chapter 8. (by V.A. Petrov) reviews the synthetic methods and utility of “FAR” reagents. Chapter 9. (by R.P. Singh, D.T. Meshri and J.M. Shreeve) is devoted to nucleophilic fluorination with DAST and Deoxofluor. Chapter 10. (by V.P. Reddy, M. Perambuduru and R. Alleti) reviews the available methods for synthesis of gem-difluoromethylene compounds. Chapter 11. (by T. Okazaki and K.K. Laali) focuses on the synthesis and utility of fluorinated PAHs. Chapter 12. (by M. Hein and R. Miethchen) provides a review of the methods that have so far been used in carbohydrate chemistry to synthesize fluorinated sugars and examines the utility of glycosyl fluorides in chemical and enzymatic glycosylations. Chapter 13. (by C. Audouard, J.-M. Ma and D. Cahard) reviews and evaluates recent progress in enantioselective electrophilic fluorination. Chapter 14. (by T. Kitazume, T. Matsuda and K. Nakamura) demonstrates how chiral fluorinated compounds can by prepared enzymatically. Chapter 15. (by T. Konno and T. Ishihara) is devoted to fluorinated pi-allyl and pi-allenyl metal complexes and their chemistry. Chapter 16. (by Y. Shen) concentrates on fluorinated beta-keto-phosphonium salts and –phosphonates and their efficacy in synthesis.